- Direct Driven - Air Compressors. A range of piston compressors ideal for the use in automotive shops and light industries. Effective Air compressors are compact, light and handy. These direct driven air compressors have lubricated air pumps with cast iron cylinders, aluminium head and carter and a robust plastic cover which allows air flow for an easy and efficient cooling of the head. The electrical motors have been designed for durability. 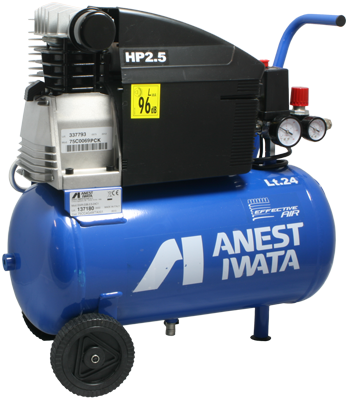 A larger Effective Air 50 Litre Tank Compressor is also available. Air hose with 8mm (1/4 inch) bore and 1/4 BSP connector for supplying air to spray guns. OR a 1/8 inch bore hose with 1/4 BSP connector on the compressor end of the hose for connecting airbrushes.